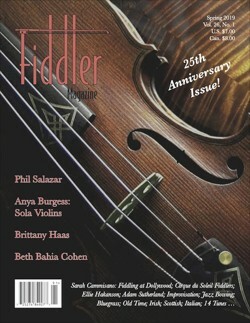 Founded in 1994, Fiddler Magazine is an informative, educational, and entertaining resource for fiddlers, accompanists, and appreciative listeners. Each quarterly issue (now approx. 60 pages each) features a variety of different styles of fiddling, as well as plenty of other articles and columns. Regular columns include: Bluegrass Fiddling, “The Practicing Fiddler,” Fiddle Tune History, On Improvisation, Irish Fiddling, Cross-Tuning Workshop, Cross-Canada Fiddle Tour, and reviews of CDs, books, and DVDs. Each issue also includes transcriptions of several tunes. A New Version of "Red Wing"
Columns and tunes: Waltzes & Airs ("Mrs. Jamieson's Favorite"); The Hidden Note ("Julia Delaney," as played by Con Cassidy); Irish Fiddling ("Amhrán na Páise," based on the singing of Joe Heaney); Jody's Column ("Snow Shoes," as played by Tommy Jackson); Scottish Fiddling ("The Wizard," by Adam Sutherland); Improvisation (Of Diagrams, Dots, Neighbors, and Passing Tones); Notes on Learning; Bluegrass ("The Florida Blues," as played by Joe Meadows); The Intrepid Fiddler ("Tarantella Ticino"); The Practicing Fiddler (Jazz Bowing and Bebop Scales); Fiddle Tune History ("Old Voile," "J.B. Miller's Hornpipe," "A Favorite Hornpipe," "Reefer's Hornpipe"); Reviews; "Fiddle-toon" comic; 14 tunes, including "Silver and Slate," composed by Judy Hyman in honor of Fiddler Magazine's 25th anniversary. And more! Sophie Lavoie; Paul Brown; Cathal Hayden; Violin Maker R.J. Storm; Gerry Harrington; Tatiana Hargreaves; Bronwyn Keith-Hynes; Buddy Spicher; Ricky Skaggs; Rickie Simpkins; Katrina Nicolayeff & Roberta Pearce… and lots more! Visit our store for DVDs, books, back issues, T-shirts, ball caps, and more!